George Sinas has been recognized by Leading Lawyers as a “Top 10″ Michigan plaintiffs’ personal injury lawyer. He is one of only two personal injury attorneys outside the metro-Detroit area to be listed in the Top 10. Attorneys who are recognized by Leading Lawyers are recommended by their peers as being among the best in their practice area. Less than 5 percent of all Michigan attorneys receive the Leading Lawyers distinction. The Leading Lawyers designation is one of many honors that George has received during his legal career. He received Michigan Lawyers Weekly’s “Lawyer of the Year” award in 2013, the Michigan Association for Justice’s “Champion of Justice” award in 2014 and the Michigan Defense Trial Counsel’s “Most Respected Advocate” award in 2015. 2017 Michigan Leading Lawyers (L-R): Mike Larkin, George Sinas, Jim Graves and Bryan Waldman. Please join us in congratulating George, Jim, Mike and Bryan on their well-deserved recognition! And there’s more good news. George and the Sinas Dramis Law Firm have also been prominently featured in the very first issue of Leading Lawyers Magazine – Michigan Edition. The article, “George Sinas: Family Legacy Bolstered Auto No-Fault Expert,” details George’s storied career as a Michigan personal injury attorney and emphasizes his expertise in Michigan no-fault law. 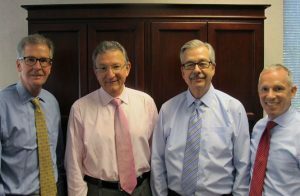 The article tells of the Sinas Dramis Law Firm history, including the story of the unbreakable bond between firm founders Thomas G. Sinas (George’s father) and Lee C. Dramis, and highlights the legal legacies of partners Jim Graves, Mike Larkin and Bryan Waldman.